7 is a special number. Magnificent, secret and magic, the 7th Art Battle Manchester will be all these things when it turns up the heat for its summer spectacular. Going head-to-head across two combat zones, a 600-strong capacity audience will watch painters, tattooists, illustrators and street artists take part in the city's largest competitive live-painting event yet. Never returning to the same venue, Art Battle Manchester's biggest battlefield to date will see art aficionados assemble at Ancoats' Mantra Warehouse – the spiritual hub and artistic mecca where street artists from across the UK have made their paint-wielding pilgrimage to add their own personal touch to its walls. In the indoor arena, 10 fearless artists will once again take to their easels to create their own masterpiece on canvas in just 30 minutes. Battling between the breezeblocks across 3 rounds of live painting, Radio X DJ Hattie Pearson will referee proceedings as the audience circulate and cast their votes to decide upon their champion artist. In the open air courtyard, some of the city's most revered and cutting-edge street artists who usually paint by night will expose their creative process for all to see when they are let loose on everything from canvas to cars. There will even be a few unexpected surprises along the way including the Ian Brown-endorsed stone sculptor known as Stone Icon. Co-organiser John, who runs the event with partner Sophie, says the event will have its own micro-festival feel; "Art Battle 7 is our biggest adventure yet – it'll be a huge painters party! The additional outdoor space allows us to use spray cans, and there will be DJs, a licensed bar and food trucks." As the full line-up is being gradually revealed through the event's Facebook page, artists to appear so far include graphic artist Jamie Smith whose "gritty and a little dark" creations will come to life alongside those of Manga-style illustrator Hannah Mosley who says her art evolves through "playing with pencils and people." "At the last few events we've had landscape artists, portraits, surrealism and comic artists," tells John. "For every piece that is plain and simple there's another bustling with chaos and colour – it's exciting because you never know who the audience will pick as their favourite." 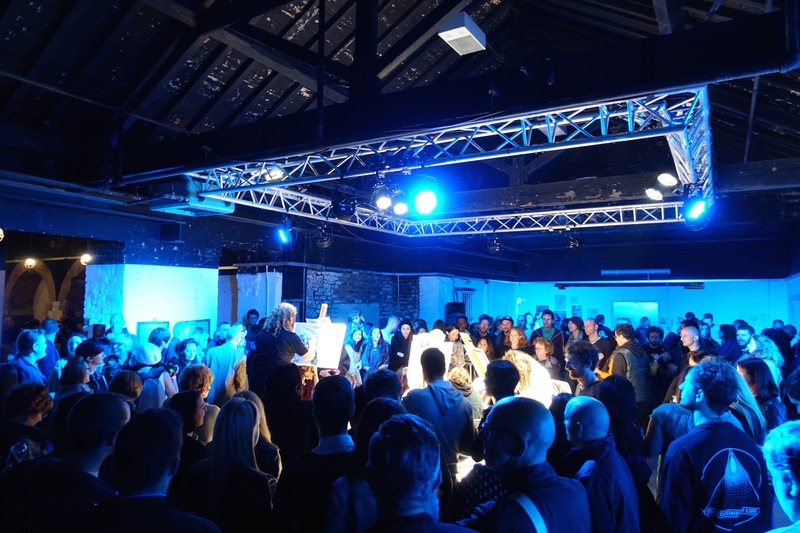 Now in its 3rd year, Art Battle Manchester remains staunchly underground but continues to add a splash of colour to the city's industrial horizon, raising the profile of aspiring stars of the arts scene as well as funds for good causes. Audience members can bid for work created on the night in a silent auction, with the proceeds split between the artists and local homeless charity – Coffe4Craig. 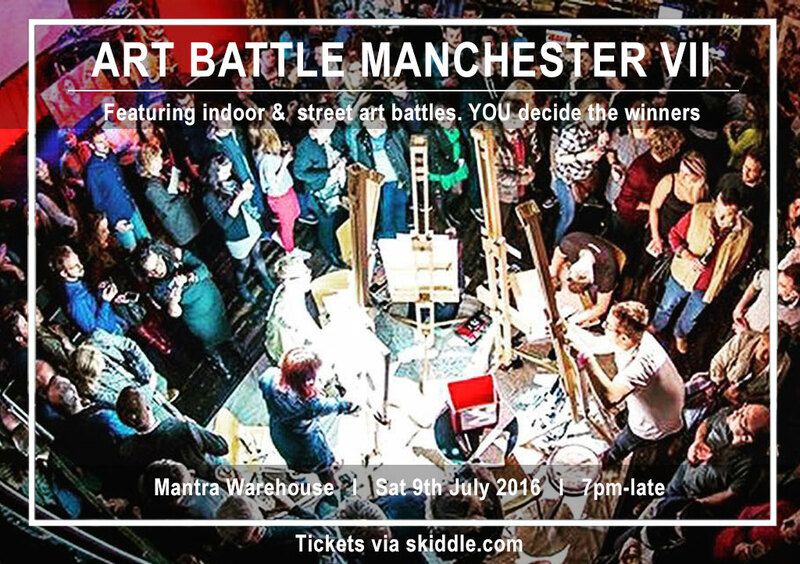 Shaking up the art world from the outside, Art Battle Manchester is the place were rules are made to be broken. With rumours of Art Battle set to dip its brush in the Thames with an imminent London appearance, it just goes to show that sometimes it's ok to paint outside of the lines.